Tin/metal version of the State Journal-Register Front Page that shows Mayor Ossie Langfelder getting a hug and kiss from his wife after securing his re-election bid as Springfield, Illinois's mayor. Dated April 3, 1991, the front page also shows the results of the Alderman races. National/World news appears at the bottom of the "page," with an article about the after-effects of the recent War in Iraq, aka Operation Desert Storm. 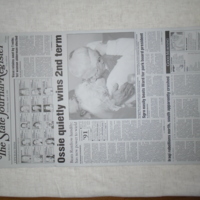 Metal version of the front page of the State Journal-Register, dated April 3, 1991, showing Ossie Langfelder's celebratory kiss for winning re-election as Springfield's Mayor. State Journal-Register, “State Journal-Register Front Page: Langfelder Re-election, 1991,” UIS History Harvest, accessed April 22, 2019, http://uishistharv1.uis.edu/items/show/225.